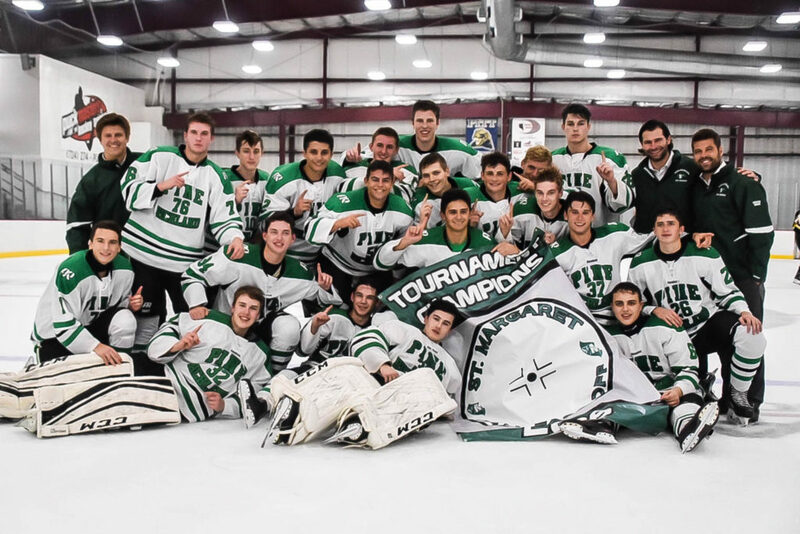 HARMAR TWP., PA — On Monday, Sept. 17, the Pine-Richland Rams defeated the North Allegheny Tigers, 7-3, at Alpha Ice Complex to win their second straight St. Margaret Fall Faceoff championship. Pine-Richland toughed out a close victory over Central Catholic, 3-1, in the first semifinal of the tournament. In the adjacent rink, the Mars Planets took a 2-0 lead over the North Allegheny Tigers into the second intermission. The Tigers managed to tie the game late in the third to send it to overtime. After a scoreless five-minute overtime period, the game was won by North Allegheny in a shootout. The final game featured a fast Rams offense, who jumped to a 3-0 lead early in the first period. Tigers goaltender Richie Karapandi rebounded from a difficult first period, stopping all 10 shots he faced in the second period as his team scored two goals, cutting the deficit to one as they entered the third period. Midway through the final period, the Tigers scored, tying the game at 3-3. The Rams scored the final four goals, winning the championship 7-3.